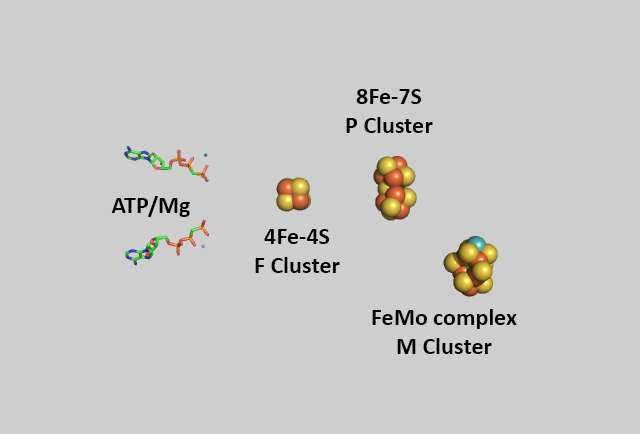 The overall structure of the protein complex with bound ATP and metal centers are shown below. 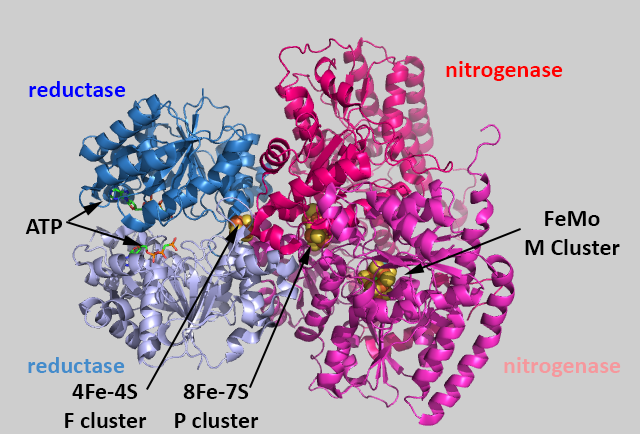 An interactive Jsmol structure of nitrogenase is found in the link below. An enhanced view of the bound cofactors and ATP are shown in the same spatial orientation in the figure below. The metal centers are shown below in more detail in both line and space fill views. Mo is bound to 3 sulfur ions and two a OH and carboxyl group of 3-hydroxy-3-carboxy, adipic acid in the crystal structure of shown above. The M cluster has an interstitial carbide ion that derives from -CH3 attached to the sulfur of S-adenosyl-methionine (SAM) allowing the carbide to be labeled with either 13C or 14C for mechanistic studies. These labeled carbides are not exchanged or used as a substrate when the enzyme undergoes catalytic turnover. Hence it seems that the carbide probably just stabilizes the M cluster. it won't be shown in the figures below showing more detailed mechanisms.